One of our new activities at Spinnaker Resorts this season is the Lowcountry Excursion. Adventure off island and immerse yourself in the rich history that Beaufort has to offer. 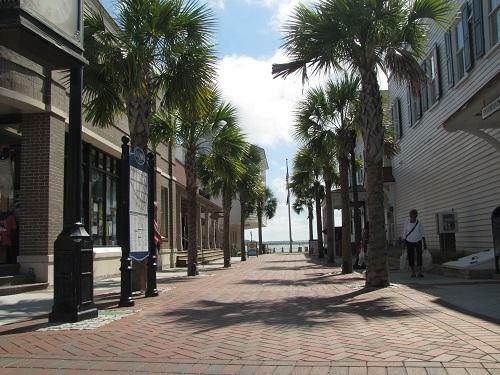 This excursion will take you into the heart of Beaufort to explore the Port Royal Sound Maritime Center, Santa Elena History Center, Downtown Beaufort, and the Beaufort Historical Museum. Every Friday the Activities Director, Marci-Anne, takes a tour group out to explore the Lowcountry for the day, picking up Spinnaker guests from Waterside at 9:15 a.m. and Bluewater Resort and Marina at 9:30 a.m. I decided to take advantage of this great experience and join her on the tour! The drive is less than 40 minutes to Beaufort, but the stories told along the way are so attention-grabbing that before you know it, you will have reached your first stop. At the Port Royal Maritime Center we experienced animated exhibits, discovered the sounds of sea animals, and learned the local history of Chechessee River, Broad River, Port Royal Sound and more. 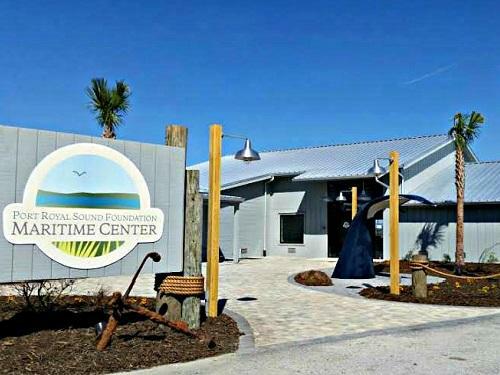 The Maritime Center is halfway between Hilton Head Island and Beaufort, located on the Chechessee River. Marci-Anne is a volunteer at the Port Royal Maritime Center, so she has behind the scenes knowledge about each exhibit. She introduced us to Chris Kehrer, who is the Naturalist and Education Coordinator for the Port Royal Sound Foundation. He walked us through the interactive exhibits showing the basics of the local ecosystem and the connection to the variety of sea creatures in the area. Kehrer explained that Beaufort’s rivers are actually not true rivers because the area is made up of ocean salt water. The town of Beaufort is made up of 60% water and 200,000 acres of marsh. One of the exhibits showed how divers call these rivers a “hot spot” for divers due to the abundance of shark teeth at the floor. Kehrer noted the murky water is a sign of a healthy ecosystem, adding a level of safety for divers since the sharks have plenty of fish to keep them occupied. If you are interested in seeing the largest shark teeth in the world, there is a cast of Megalodon jaw hanging on the wall in one of the exhibits. I suggest going out to the dock and watching the boats pass and taking in the scenery. Once back in the van, we travelled over Port Royal Sound while listening to stories of Hilton Head and Beaufort during the Civil War. In 1861, the Battle of Port Royal left Hilton Head Island to fall to the Union. Homes and other buildings were burned to the ground, except for 7 antebellum structures that still stand today. When residents of Beaufort got word of the destruction of Hilton Head, the “Great Beaufort Skedaddle” saved the town from the same destruction that Hilton Head Island had faced. The town’s people took what they could, and left their slaves, livestock, and homes behind. During this time period, Beaufort was one of the wealthiest cities with large plantations, summer mansions on the water, and an abundance of crops making it also one of the most beautiful cities of its time. When the Union soldiers came into town, the slaves waved handkerchiefs surrendering to the Union. Instead of destroying the beautiful town, Union soldiers moved into the homes and set up a base in downtown. One of the buildings saved and turned into a hospital was the Beaufort Courthouse. This courthouse is now the Santa Elena History Museum, and our next stop. Take in the beautiful sights of Beaufort. The surrounding antebellum homes are stunning and the water is breathtaking. Walking into the Santa Elena History Museum, you are now going even further back in history to discover America’s oldest settlement. You may have previously been taught that St. Augustine was the oldest settlement in America, but in 2015 archeologists discovered an entire city buried under the golf course on Parris Island, known as Santa Elena. Follow the museum’s timeline dating back to the 1560’s and discover the European connections to the oldest settlement. Archeologists are still uncovering parts of the settlement today. Remember your cameras on this trip so that you can capture the beautiful sights and atmosphere of Beaufort. The tour has about a 2 hour window for everyone to shop and eat lunch. We parked in downtown Beaufort and the group scattered. Marci-Anne and I decided to walk down to Lowcountry Produce for lunch. If you are looking for real southern cookin’, this is where you want to go. If you like sweet and savory foods, try the tomato pie and the macaroons. After lunch we walked down to the water. On our way, I noticed some Tabby from the 1700s on the exterior walls of the shops and restaurants. One shop in particular had a small sign on the side stating “Tabby – Circa 1760. 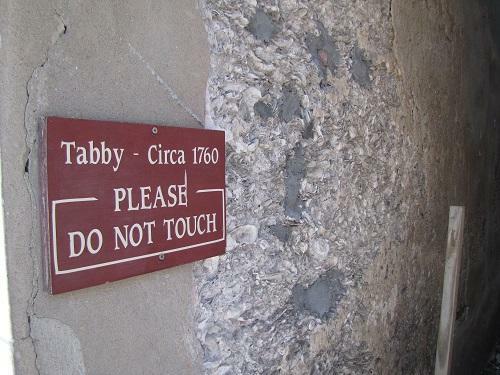 Please do not touch.” Tabby is a mixture of local material including shells, sand, lime and water. This mixture was popular because upon hardening, it produced a very sturdy wall. Once we got to the water, we sat on benches and watched the boats go by. After lunch, we moved on to the Beaufort Arsenal, now known as the Beaufort History Museum. The museum building was constructed in 1799, and served as a key structure during the Revolutionary War and Civil War. The exhibits at the Beaufort Museum begin with the 1500s when Santa Elena was founded. 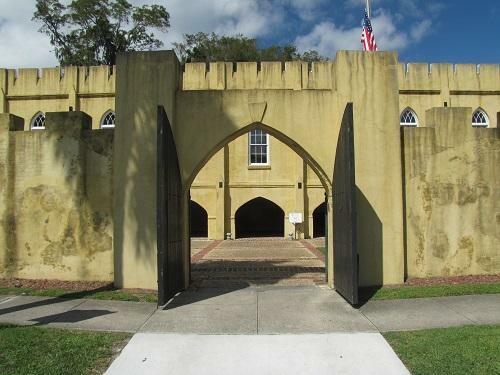 After you have experienced time of the French and Spanish settlers, then you can move forward to the period where Beaufort was the wealthiest city in the New World. It is said that Beaufort was home to the first thoughts of the secession from the British Empire. Take in each exhibit to discover the struggles and successes of Beaufort over the course of the last 500 years. I really enjoyed this exhibit, because the staff was very enthusiastic and well-informed about the history of Beaufort. On the way back, Marci-Anne drove the tour group through the Historic Housing District. The antebellum homes still stand tall and as beautiful as ever amid the famous oak trees with Spanish moss dangling from the branches. A majority of the homes are occupied and not open to the public, but you are welcome to drive by to admire them. On your journey, you may even get to see Robert Small’s home, the Beaufort Castle, and the Cuthbert House. The Spinnaker Resorts’ Lowcountry Excursion was one of the most exciting excursions that I have ever been on and I truly encourage you to explore the town of Beaufort with us! You can sign up for the Lowcountry Excursion in the sign-up book, located at both the Waterside and Bluewater Front desks. Did you join us on the Lowcoutry Excursion? Share your thoughts with us on Social Media!